How cool is this? From TokyoMango, sent to me by Mr Broke Hoedown. Today’s MouseGuest Weekly Podcast features a segment my BFF Lisa and I recorded live this week with Dan and Eric, commenting at length on various criticisms we’ve heard of the Year of a Million Dreams. Per usual we also take a few tangents, like poking a bit of fun at other Disney podcasters, and taking inventory of my Pal Mickey’s rapidly-expanding custom wardrobe. 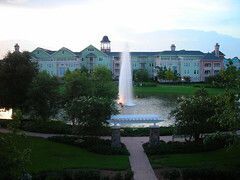 Yes indeed, it was another fabulous trip to Walt Disney World, this time made extra-special by a free upgrade to Saratoga Springs Resort (we had booked Pop Century) and the “Free” Disney Dining Plan promotion (yes, I did the math . . . in our case we really did save money on paying rack rate in order to get “Free” dining). 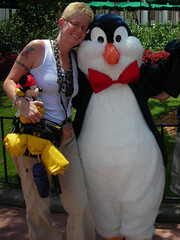 Best Cast Member Pixie Dust: Eric from Illinois, at Disney-MGM Studios. Some Cast Members are so special, I just gotta let everyone know (including Disney management, who’ll receive a note from me shortly). The last night of our stay, my son lost a souvenir mug he’d just purchased at Pizza Planet. I cannot begin to tell you how traumatic this was . . . all the stresses and sadness of the vacation coming to an end somehow crystallized around this lost mug, and I was not sure how we could recover. Stopping by Guest Relations, we were greeted warmly by a Cast Member named Eric, from Illinois. Eric not only advised us on how to use the lost-and-found registry, and how to contact WDW Merchandise to try to purchase a replacement, but he took the time to walk with my son to Mickey’s of Hollywood, and let him pick out any mug he’d like. Eric’s kindness, care, and patience with my sad little boy were exactly the pixie dust we both needed. And a strong runner-up: Michael from Florida, who chatted with us as we waited for a table at the Sci Fi Dine In. My son and I were particularly impressed at how patient and calm Michael was when confronted by an angry Guest who didn’t seem to understand how the Advanced Dining Reservation system works. Best Fine Dining Experience: Le Cellier. This hot spot lived up to its reputation. The service was superb, the pretzel bread delicious, and the New York Strip Steak (aka the Scopa Special) cooked to perfection. The Cast Member serving our meal chatted amiably with us, and worked closely with my son to ensure that he had just the right food for his very particular tastes. I never would have booked a meal here without the Dining Plan, but now that I’ve tried it I’ll eat there again, even if I need to pay full price. Also, a little tidbit of advice: If you’re hoping to get into Le Cellier and can’t get an Advance Dining Reservation (ADR), try dropping in right when they open for lunch (or dinner, but the odds aren’t as good). When we sat down at 11:50am for our noon ADR, only about 20% of the tables were occupied, despite the fact that Le Cellier is apparently fully booked until December. Cast Members told us that there are often tables available for walk-ins during the first 20 minutes or so after they first open, due to the high number of no-shows for those early slots. Worst Fine Dining Experience: Coral Reef. We had the best of all possible tables, right up against the enormous aquarium. The food was reasonably good, and the wait staff understanding when my son had to send back an entree. But the noise was simply too much – the acoustics of the room seem to amplify the din you’d expect from any family dining establishment, and I’m sure we all complicated matters by shouting a bit in our attempt to be heard from the other side of the tiny little table. We won’t be back. Best Character Interaction: Captain Jack Sparrow at the Pirate and Princess Party. Two tickets to the Pirate and Princess Party: $80. Wait in line to meet Jack: 45 minutes. Photopass pictures I ordered online today: $40, including shipping. The sparkle in my son’s eyes whenever he remembers giving Jack a set of “black pearl” beads, which Jack tenderly wrapped around his wrist? Priceless. Worst Wait Times: Saratoga Springs bus service. I was warned, I gambled anyway, and I lost. The schedule clearly stated that buses ran every 20 minutes, but our average wait was at least that long. One particularly annoying example: On Magic Kingdom’s Extra Magic Hour morning we arrived at the bus stop at 7:10am, but no bus arrived for us until 8:15am, shortly after a uniformed Disney Transportation Cast Member arrived with a clipboard and a stern look. My son had the good sense to start toting a book around for those long waits, and Pal Mickey and I just kept each other company the best we could (“Are you ready for a quick quiz?”). Best View: From My Balcony, SSR 3723. Would I have appreciated it as much had I paid full price for the Saratoga Springs studio? I doubt it. But nonetheless there it was, a beautiful and relaxing vista right in my very own room. Every day during our afternoon break (thank you for the advice. Unofficial Guide! ), I’d spend at least a few minutes sitting out on the balcony watching the fountain, watching for bunnies, and just plain enjoying what passes for privacy when you’re a parent traveling on a budget. I even caught a nice sunset or two. Worst Scheduling Algorithm: Magical Express. (Be warned: I’m gonna get geeky for real here . . . I know just enough about computer programming and algorithms to be dangerous.) I hadn’t used the Magical Express (ME) before, and was always a bit put off by the fact that you’re required to board a bus to the airport three full hours before your scheduled flight. But I never realized that this rule was applied so haphazardly. Based on a conversation I had with another family on our same return flight (but staying at a different resort), we both boarded ME buses at 7:00am, but their bus made two stops en route to MCO – one of which was at our resort, 30 minutes after we had already been required to leave. And once again, since we were on the same exact flight, it seems to me that if they could depart Saratoga Springs at 7:30am, we could have been sitting right next to them instead of already being at MCO (since our bus was blissfully nonstop). Now, I could tell myself that Disney’s just trying to trap you in MCO long enough to drop a few dollars in their stores there. Lord knows I did! But I think it’s really just a question of lazy scheduling. Because ME knows your itinerary (and in our case even provided flight check-in at the resort), certainly someone could easily design a scheduling algorithm that looks at the various Guest itineraries and optimizes ME departure times based on ensuring that all Guests scheduled for Flight XYZ arrive at MCO 2 hours in advance of Flight XYZ, rather than just a hard-and-fast rule requiring that all Guests have their butts in ME seats 3 hours before Flight XYZ departs. Had such an algorithm been in place, we might well have had time for one final round of Mickey Waffles, instead of having to be on the bus before Artist’s Palette opened for the day. Harumph. Best Marketing Strategy: Continuation of the Year of a Million Dreams. I’m still sold on it, as surely as I was last October. Sure, in many ways it’s really more like the Year of a Million Free Lanyards, with a couple big prizes thrown in (many will enter, few will win), and I giggled this morning when I heard Scopa call it the Year of a Million Refurbishments. But those free lanyards feel more magical than they have any right to be, especially when you’ve spent too much of your morning waiting for a bus. And my son’s very proud of the Dream certificate he was awarded for throwing a basketball around with a few Cast Members one morning at Epcot. The price of magic goes up this weekend at Walt Disney World, where the basic adult ticket is climbing 6 percent to a record $71. Disney on Friday announced a whole range of new ticket prices that take effect Sunday. The price changes also affect the discount packages that still can push the per-day cost below $23 for adults who want to commit to as much as a 10-day run at Disney’s four theme parks. But almost all the prices are going up. And for the second year in a row, Disney is raising its prices in August rather than in December or January, when theme parks historically announced price increases. Don’t Forget to Thank Extraordinary Disney Cast Members! If you visit Disney regularly, I’ll bet you’ve got plenty of stories of Cast Members who went above and beyond the call of duty to make your visit special. Maybe it was as simple as an in-depth conversation, or as extreme as helping you through an emergency medical situation. Most of us regular Disney Guests have memories of these special CMs . . . so why not thank those CMs by letting their boss know how special they really are? Mike Scopa’s column at MousePlanet reminded me today about the importance of thanking Cast Members who go the extra mile (and yes, of letting someone know when something’s amiss). And when I read his column, boy was I glad I’d taken notes last week! It made it easy to dash off a quick email to wdw.guest.communications@disneyworld.com, letting them know about a few CMs who’d made our trip special. They also point out that if you stayed at a WDW Resort, they’d appreciate knowing the resort’s name, and the dates of your visit (though I’m not sure why that’s relevant if you’re complimenting, say, a Cast Member at Epcot). And if you send them email, don’t include files over 2MB. When Will Walt Disney World Add Another Park? Blue Sky Disney has an interesting article today, speculating about roadmaps for new parks at Disney resort areas worldwide. The bottom line? We won’t see additional “gates” at any of the existing resorts for another decade. When [WDW resort hotels] start approaching Disneyland levels (above 90 percent) then you’ll see the executives in Team Disney Burbank start putting those blue sky plans on the front burner. Um, about that . . . doesn’t seem to me that’s likely anytime soon, especially if you include DVC (there seems to have been a recent glut of Saratoga Springs rooms on the market lately). And hey, Pop Century Legendary Years, anyone? Apparently occupancy rates at WDW haven’t even been high enough to convince Disney to finish building it. The article has good analysis and interesting speculations. And don’t miss the comment, there’s some good conversation going on there too. After much internal debate, and not a small amount of sheepishness, I’ve bought my first Pal Mickey. My descent into the Dark Side seems to be complete. 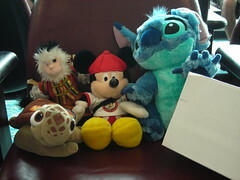 But Pal Mickey isn’t the only adorable souvenir that accompanied us on our flight home. 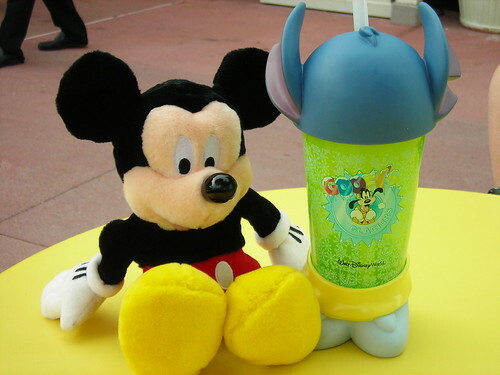 At Club Cool in Epcot, my son created his own custom slushie cup, which immediately took on a life of its own as Princess Stitch, and pal’ed around with Mickey for the rest of the day. All hail the power of a child’s imagination! 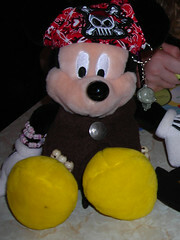 Pal Mickey: About $61, with my Annual Passholder discount at the World of Disney store. Princess Stitch: About $8, filled with Frozen Coke. 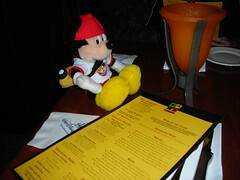 Pal Mickey: Soft and plush, like you’d expect any plushie to be. The metal casing for his electronic innards is mostly well-covered, with the exception of his disturbingly hard and rectangular tushie. Princess Stitch: Hard and smooth, like you’d expect any plastic cup to be. It’s hard to tell the difference between Princess Stitch cozying up to you for a cuddle, and Princess Stitch whacking you in the bicep. And isn’t that just what you’d expect from Princess Stitch? Pal Mickey: Disney sells a few outfits for Pal Mickey, plus there’s a great big beautiful world of teddy bear and doll clothes which either fit Pal Mickey, or can easily be altered to do so (um, am I really suggesting here that Pal Mickey needs a tailor?). 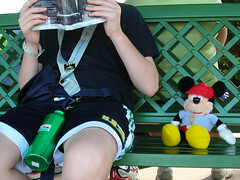 PalMickey.net has an excellent page on sources of Pal Mickey attire. 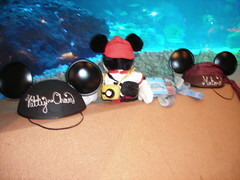 Plenty of Pal Mickey fans also seem to be rather handy with sewing machines. Princess Stitch: Extremely limited. If you need a new pair of shoes you might luck out; when our Princess Stitch lost his adorable blue mid-heel pumps, I found the Cast Member in Club Cool was kind enough to give me a replacement, gratis (though he certainly did look doubtful when I told him my son had lost the princess shoes cup item). I’m sure any number of cup cozies could be let-out to accommodate Princess Stitch’s impressive circumference, or easily whipped up with a sewing machine, but there just isn’t much available ready-to-wear. Princess Stitch: Doesn’t offer any Disney Parks touring tips, doesn’t play any games, but is perfectly designed to hold a frosty beverage. Advantage: Pal Mickey, by an adorable shiny little nose. Setting aside price, Pal Mickey takes it in a walk. But if I figure in the price, it’s a tougher call, because then I need to think about the long term. 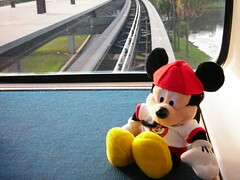 Will Pal Mickey end up gathering dust on a shelf, just as I suspect will happen to Princess Stitch? Will I tire of his corny jokes and incessant buzzing? Or will I really make that costume I’ve been thinking about, for Pal Mickey to wear to the Pirates and Princesses Party next month? If my son lobbies for a matching outfit for Princess Stitch, it will truly give me reason for pause.